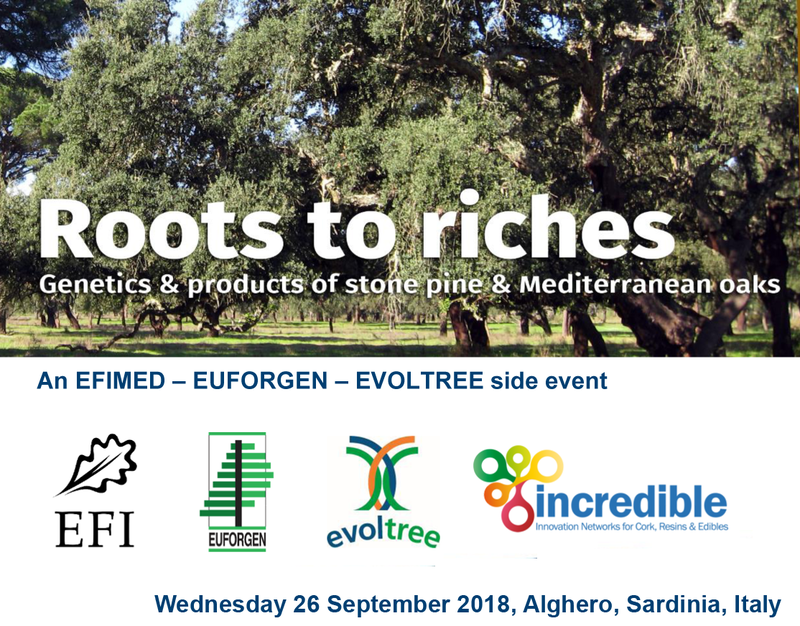 EFI Mediterranean Facility, EUFORGEN and EVOLTREE are joining forces to bring you a fascinating exploration of some key Mediterranean species this autumn: Roots to riches: Genetics products of stone pine and Mediterranean oaks is a full day Scientific Seminar taking place on 26 September as part of EFI's 2018 Annual Conference which is held this year in Alghero, Sardinia, Italy. The seminar focuses on two specific issues of Mediterranean forestry: Non Wood Forest Products and sustainable bioeconomy. Discussions start from the state of the science and management, with the aim of strengthening networking and collaboration across forest management, industry and research. The event is held in collaboration with INCREDIBLE project, European Hardwoods Innovation (EHIA) and the French Institute of Technology for Forest-based and Furniture Sectors (FCBA). The draft programme (PDF) of this Scientific Seminar is now available. Register now here. SEE ALSO: Registration for the EFI 2018 Annual Conference week here (both EFI Members and non-members).